Implicit bias leads to unequal and differential treatment of patients by race, gender, age, language, and in many other areas. The consequences of such bias can have a negative effect on the trust of patients and families, and creates barriers and obstacles for palliative care teams. 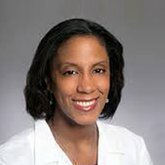 Recently, the Center to Advance Palliative Care (CAPC) sat down with Kimberly Curseen, M.D., Associate Professor of Internal Medicine at Emory School of Medicine and Director of Outpatient Supportive/Palliative Care, Emory Healthcare. In this interview, Dr. Curseen shares her thoughts and personal experiences with us in part 1 of a 2-part discussion on implicit bias. CAPC: Dr. Curseen, Implicit bias has been getting a lot of attention as a topic lately. You’ve been active in this area for some time. How did you come to be interested in implicit bias? Dr. Curseen: I was working in the Department of Geriatrics at the University of Arkansas. The curriculum for medical students did not cover implicit biases in a concrete way, nor how to communicate cross-culturally. Yet when the students go out to practice, they’re going to be developing treatment plans and being held accountable for how successful those plans are. If we don’t equip them with skills to be able to communicate across a broad range of patients, then that sends them out into practice with one hand tied behind their backs. CAPC: How do you define implicit bias, and how is it different from prejudice? Dr. Curseen: Implicit bias is a judgment or behavior that results from subtle cognitive processes, on the subconscious level. People hear or see something, and they have an initial response of which they’re not even aware. It’s unintentional. We all have implicit biases. Prejudice, on the other hand, is unreasonable and conscious feelings and opinions and attitudes that are usually hostile towards one or more specific ethnicities, races, social groups, or religions. Implicit bias is the foundation for conscious feelings of prejudice and associated behaviors. CAPC: What are some examples of different types of bias? Dr. Curseen: One great example is age bias: When a doctor walks into the room and sees an elderly person sitting there with his adult child, the doctor often introduces herself to the adult child before she introduces herself to the patient. Or, she hands the papers and the discharge paperwork at the end of the visit to the caregiver, and directs all the instructions to the caregiver, instead of directing the instructions to the patient. Now, if somebody asked you whether it’s appropriate to discriminate, you would say no. If we asked medical students or doctors “If a patient comes with a caregiver, whom should we be focused on?”, everyone would say the patient, and that is the intention, but our implicit and unconscious bias leads us to react in a different way, that we are not consciously aware of. 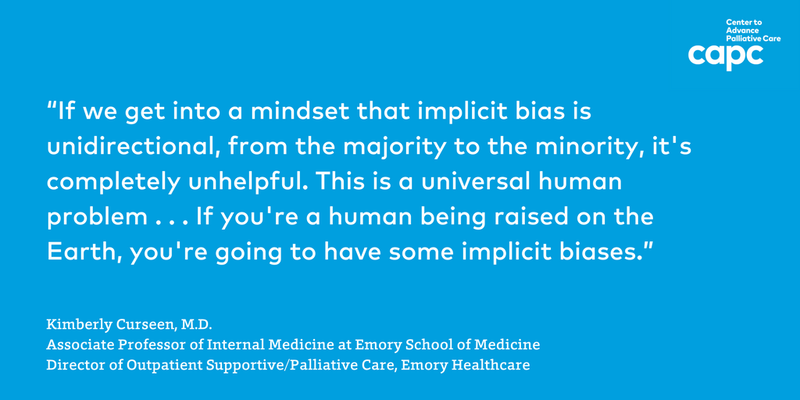 CAPC: Do you think the potential impact of implicit bias on a palliative care provider is different from how it affects other types of medical care? Dr. Curseen: We are all a combination of our life and social experiences, and of what we’ve been taught, both explicitly and implicitly, through the “hidden curriculum.” The white coat is not something magical, and a palliative care fellowship doesn’t immunize us from universal human short-cuts and reactions manifested by implicit bias. I think the consequences of implicit bias can accumulate for a patient, especially someone with serious chronic illness who has moved through the system many times and by the time he or she gets to palliative care, usually a little later than we’d hope—the stakes can be incredibly high, because this is often the point at which patients are asked to make these major life decisions. Diminished patient and family trust resulting from repeated experiences of bias over time, most of it unconscious and unintentional, poses a major challenge for palliative care teams who must establish relationships and build trust under high stress and time-pressured circumstances. If we’re not able to create a trusting connection with our patients and their families, that puts our ability to serve our patients in jeopardy. If your surgeon doesn’t connect with you personally, she can still do the procedure and it can work out fine, even if there’s not an emotional bond. Palliative care teams, on the other hand, must develop capacity to signal that we see and care about our patients and their families as whole persons. We rely heavily on trust to enable the communication necessary to help patients navigate this very difficult process. So I do think for palliative care providers the stakes of implicit bias can be especially high. We are not any better or worse than other people or professions, but our attention to it and our ability to manage it needs to be a priority in order for us to do our work effectively. Palliative care teams . . . must develop capacity to signal that we see and care about our patients and their families as whole persons. We rely heavily on trust to enable the communication necessary to help patients navigate this very difficult process. CAPC: How could that then contribute to health disparities? Dr. Curseen: Article after article says that people of color want aggressive therapy until the day they die. This includes, for example, not using hospice, wanting more life-prolonging treatments, not fully understanding what’s happening, and making choices that we health professionals think are bad decisions when patients are extremely ill or nearing the end of life. If you’re a health professional indoctrinated with that belief, then when you walk into a room of somebody who doesn’t look like you and start to have this very difficult conversation and get push-back, if your predisposition is, “They are going to want aggressive therapy anyway,” then maybe you don’t try to build a trusting relationship first. So, instead of asking the person open-ended questions like “What are you hoping we can accomplish for you or your loved-one?” or “What are your greatest worries and concerns?” we instead document that the patient “wants everything done,” sign them out as full code, and feel like we’ve done our job. Meanwhile, the reason they’re pushing back may have absolutely nothing to do with firm cultural or religious beliefs and may instead be a reflection of hundreds of trust-eroding micro-communications over repeated medical encounters that require a different approach to building the necessary trust. Do you change the way you communicate and the options you offer because you’re predisposed to believing that this group of people will not be interested in their options? I’ve watched clinicians walk into hospital rooms of minority patients, and the clinicians are frightened, and I can see that they’re frightened. And the patient can also tell that the clinician is uncomfortable, and is wondering, “Why are you frightened?” So, now the patient is anxious and frightened, mirroring the unconscious feelings that the doctor brings into the room. It turned out exactly the way the doctor feared it would, because that’s the script he brought into the room. CAPC: You shared your own personal experience in a recent CAPC webinar. Would you share the story of that visit here too? Dr. Curseen: Yes. I’m an African-American female, and I practice with the hospice medical director in Arkansas. I drove out to a house to talk to a family after getting a report from the nurse that the patient was probably actively dying, and the family was having a hard time. We knew that the resources were poor and a storm was coming, and that area always loses power. What we didn’t want to happen was for the patient to be completely stranded there, unable to access any help, and also have a family left out in the cold when we had a perfectly good inpatient center that could provide quality care and keep everybody safe and comfortable. As I pulled up the long driveway to the house, there was a huge Confederate flag semi-draped over the door. Dogs were in the yard in various states of health, barking ferociously at me. I’m sitting in my little Nissan Versa, and the moment I see that, I can feel myself tense up, and I know I need to get in there, and I know I need to get out of there, and I’m angry. But I think, “Oh, it’ll be all right, let me just go ahead and flip into doctor mode because I need to do what I need to do.” The house is super-old and had rotting floorboards, but they had put down plywood. The central heat had gone out. They had a heater in the room where the patient is, but the other rooms weren’t heated, and there were a few animals limping around on the floor. There were a lot of family members, and when I walked in, I looked around, and nobody acknowledged me except for the husband. He didn’t reach out to shake my hand, but I didn’t reach out to shake his. I did say who I was and asked to see the patient and whether the family was okay with me examining her. Everybody moved out of the way and allowed me to do that. Then I excused myself and spoke with the husband. I did ask him what he thought was going on and what were his thoughts about how to help her. He told me he thought she was dying. In the midst of this he had offered me something to drink and he offered to take my bag, and I said no to each. I was polite, but I told him what I thought was going on and that we needed to get her to the inpatient setting because the storm was coming. I told him I thought this is going to be the best thing and, if it’s all right, I would go ahead and make some arrangements. That was okay, but I didn’t introduce myself, and he asked whether a doctor was coming out. I said, “No, I’m Dr. Curseen.” But why would he know I was Dr. Curseen, because I certainly didn’t tell him. And then I told him, “Kelly [the nurse] is going to come out.” So, if he wanted to ask me a question, I basically told him that the nurse is coming and she would answer any questions. Then I was sitting in my car, realizing that usually we leave a visit like that and feel good, and I felt anything but good. I was worried that this wasn’t going to work, because the son had this surprised, disbelieving, even shocked look on his face. I realized I hadn’t talked to him about anything, and he could go back in and protest the plan for his mother, and the storm could come. So, I call up my nurse and said, “I’m going to need you to come out and talk to the family again, make sure they’re going to be okay with everything.” Then I pulled away and left. All the things that make me when I’m talking to somebody, I did not do. So, they got care, but I’m not sure they got the best care, and they certainly didn’t get the care that other people would have gotten, mainly because I was too wrapped up, I think, in my own feelings of hurt and anger, and too unaware of what was happening until it was too late. CAPC: Thank you for sharing this so honestly and in such detail, because I think it’s really helpful for us all to ask the questions: What are we doing? How does it impact a situation? and What are the cascading series of actions? Dr. Curseen: Yes, because if you read the literature, you would think only a certain people can be implicitly biased, and that’s not true. We all do it. So, if we get into a mindset that implicit bias is unidirectional, from the majority to the minority, it’s completely unhelpful. This is a universal human problem. It’s not a specific culture or group problem. If you’re a human being raised on the Earth, you’re going to have some implicit biases.